A really fascinating, almost hypnotising focus of Jeanne turning on the light whenever she enters a room and turning off the light whenever she leaves a room stays with me after those almost four hours I spent with Chantal Akerman’s masterpiece yesterday. Of course, Akerman says a lot more in this film. Yet I felt absolutely drawn to this small, ordinary action we all do every day, which the director, in her exploration and recording of a housewife’s routine and daily chores, highlights almost to the extreme. I cannot recall a single film that renders this ordinary gesture extraordinary to such an extent. I’m aware that Akerman’s Jeanne Dielman, 23, quai du commerce, 1080 Bruxelles (1975) has been talked and written about from various angles, but there is something in this persistent turning on and off of the light that really struck me as marvellous, as simple as the action may seem or actually is. Perhaps one can call it a visual meditation, a meditation on screen, calling on you to be present, to be in the moment and notice your surrounding and be present with everything you do. Don’t get caught up in thinking. Just be…with the light switches, in that case, something in your house that I’m sure you never even think about until it stops working. 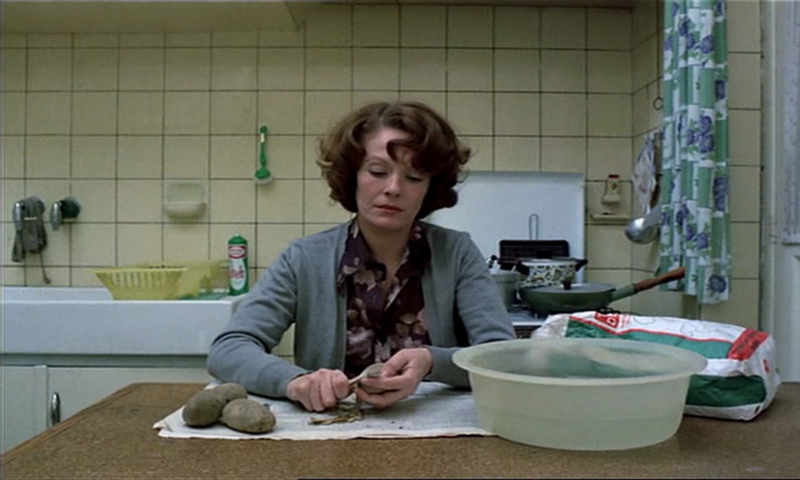 Jeanne Dielman is a magnificent piece that really is as brilliant as it is simple. Akerman’s long takes of repetitive actions cause the images to dive very slowly into your brain. They dig into it and take roots there. At the very beginning of my exploration of Lav Diaz’s films, I had the feeling that I could remember an entire film, scene by scene, because Diaz places emphasis on time, on duration. Unless we’re speaking of traumatic memories, which are often distorted and incomplete, creating memories of something takes time. On a basic level, we can think of learning a foreign language; learning vocabulary, learning grammatical structures. Over and over again. Until one day, we become fluent and no longer need to actively think about the right word to use in a sentence. It becomes natural. One begins to live a language. While watching Jeanne, I felt as if I learned something, as if I learned each scene as a form of language which Akerman tries to teach me, a language that I would become fluent in at some point. I couldn’t help but think about all the other slow films I have seen since late 2009. It’s been almost ten years that I have been following this, and yes, of course, even though Jeanne has always been one of the icons of Slow Cinema, I have admittedly watched it late in my personal and professional exploration of the film movement. At the same time, I believe that it came at the perfect time. It was with my discovery of Lav Diaz that I began to see the real value of slow films. Contrary to the argument that nothing ever happened in those films, I realised that there is a lot going on, but it’s rather small, almost unimportant things that we tend to overlook, just like the repeated action of turning on and off the light. Jeanne is a hyperreal film, in which a lot happens. Not much is said. Dialogues are rare, and emphasis is placed on Jeanne’s daily chores. She follows her daily routine. Always the same thing, for the same amount of time. Until something upsets the routine. Those small things we wouldn’t worry about become a real source of tension on the one hand, and exhaustion on the other throughout the second half of the film. The film, or rather Jeanne, becomes a collapsing house of cards. Her routine unravels. Given her absolute insistence on it, it is spiralling out of control. To add to this, Akerman creates a tension here between narrative and mise-en-scène. The director maintains her well-organised, rigorous, static framing and opposes it to the collapse of Jeanne’s routine, to the collapse of her protagonist’s state of mind, to her exhaustion. Stasis versus movement, rigorousness versus upheaval, stability versus collapse – these are the underlying themes that collude over and over again. Perhaps an example is an order. Not long after the start of Jeanne Dielman, I began to think about Liu Jiayin’s 2005 Oxhide I. The experience of the film, of the actions that take place in Jeanne’s appartement, had a degree of claustrophobia to it. I remember Liu’s film creating this tense atmosphere that was impossible to escape. Akerman doesn’t always use the same tight framing, but her mise-en-scène feels tense. There is a pretty strong discrepancy between the (medium) long shots and the obsessive-compulsive action that takes place in front of the camera. The former allows for freedom, the second imprisons you. It’s not easy to create a clearly-defined feeling about this film, because there is a constant shift between those two extremes. Just as Jeanne shifts between those extremes in the second half of the film – she upsets her routine while trying to pursue it – so does the viewer. This is what makes the film, despite all its routine, its repetition, its ordinariness, its simplicity, so exciting. It reminded me of a peaceful river that, here and there along the way, shows little swirls. And it’s perhaps the perfect illustration of slow film and my own personal belief that it’s best represented by the Chinese concept of time; time as a river that carries its water at different speeds, with swirls at some points but not at others, swirls that introduce speed to the water flow, but also circularity. I cannot think of a clearer example of this than Akerman’s Jeanne Dielman. It is a shame that writing on the film focuses primarily on Jeanne, on the chores of a housewife and on feminism. Akerman always said she wasn’t a feminist filmmaker, and I think that by focusing on aspects of feminism exclusively, you actually miss the complexity in simplicity and the shifts, twists, swirls and constant changes that makes this a great film rather than “only” a representation of the hard life of a housewife in Brussels in the 1970s.